Looking for a way to replace a missing or damaged tooth? Want a semi-permanent solution that looks and feels natural? A dental implant surgically placed inside your mouth by a dental health care professional in Abbotsford might be just the solution you’ve been looking for. But what is a dental implant? Keep reading to find out more. A dental implant is made up of two parts, a titanium root and an artificial tooth. The titanium root is surgically inserted into your jawbone to give you a strong and stable bite. The artificial tooth is then securely fastened to the root to provide an attractive replacement that looks and feels just like a natural tooth. 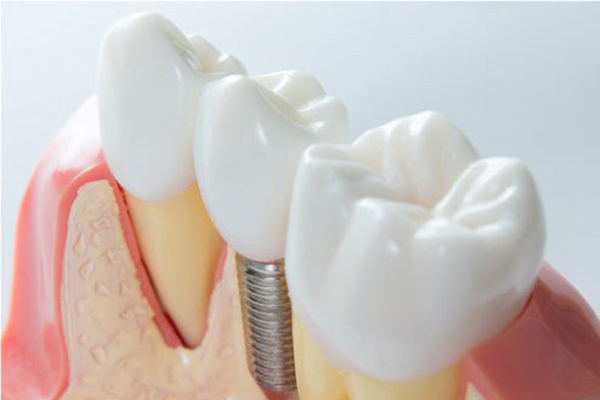 Dental implants can be used to replace one or more missing or damaged natural teeth. Not everyone is a good candidate to receive a dental implant, however. If you have experienced significant bone loss in your jaw or the health of your gums is in question, your dentist may recommend other solutions. If you’d like to find out if you’re a good candidate for a dental implant, talk to one of the dental health professionals at our Abbotsford clinic today. At Medora Dental Care, you can count on us to create a supportive environment and help you achieve a healthy smile that lasts a lifetime. Whether you need a dental implant, a regular checkup, or emergency dental care, our Abbotsford clinic is here to welcome you. Contact us today to learn more about the services we provide or to book an appointment.